Subtly but surely flavored, these chicken meatballs need little, if anything, in terms of embellishment. Of course, if you want to serve them as sliders you’ll need, at minimum, a bun. Maybe a touch of simple marinara. Cheese, if you please. But back to that bun. 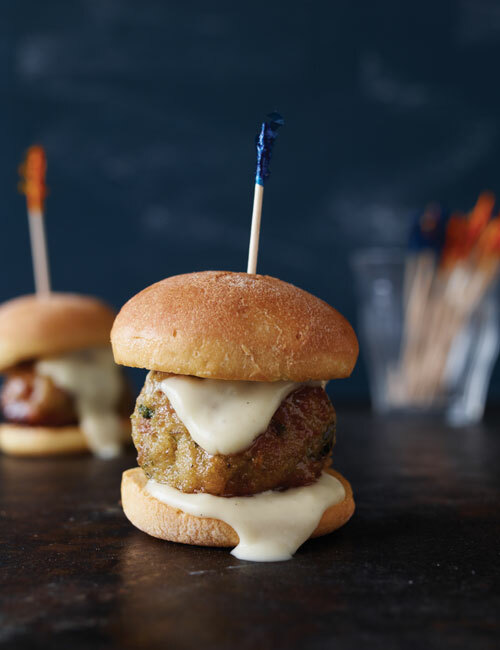 It’s the foundation of the sandwich, so it needs to be both pillowy yet sturdy, effusively flavorful on its own without overwhelming the meatball, and able to be made into wee buns that are just dainty enough for these wee sliders. We’ve got just the beautiful burger bun for you. 1. Preheat the oven to 450°F (232°C). Drizzle the olive oil into a 9-by-13-inch baking dish and use your hands to evenly coat the entire surface. 2. Combine the chicken, eggs, bread crumbs, parsley, wine, salt, fennel, and pepper in a large bowl and mix by hand until thoroughly incorporated. The mixture may seem quite moist; this is okay. 3. Roll the mixture into meatballs about 1 1/2 inches in diameter (roughly golf ball size), making sure to pack the meat firmly. Place the balls in the prepared baking dish, being careful to line them up snugly and in even vertical and horizontal rows to form a grid. The meatballs should be touching one another. 4. Roast for 20 to 30 minutes, until the meatballs are firm and cooked through. A meat thermometer inserted into the center of a meatball should read 165°F (74°C). Allow the meatballs to cool for 5 minutes in the baking dish before serving. I was supposed to make turkey meatballs for a client, but once I came upon this recipe, I opted for chicken meatballs instead. I wasn't disappointed, as they came out moist and delicious. The mixture was rather soggy but firmed up nicely in the oven. I paired these meatballs with a simple tomato sauce over pasta for a quick yet hearty winter meal. These meatballs were tasty and pretty quick and easy to make. Grinding fennel seeds was probably the most time consuming part of the prep and that was only because I had to locate my grinder. I made these with ground turkey (a mix of light and dark meat; I think I used 3/4 dark and 1/4 white meat), as I was unable to find ground dark-meat chicken in any of the three places I tried. Only one of them had ground chicken and it was breast meat. My experience with ground chicken-breast meat is that it’s way too lean, lacks flavor, and sticks to the pan, so I opted for turkey. Another option would be to buy poultry slices and grind them at home. The turkey mix worked well. The meatballs had a more robust flavor than I think they would’ve had with chicken. It took about 30 minutes to get these cooked through. They were good on a hot meatball sub sandwich with mozzarella and some tomato sauce. I cut sections from a baguette rather than going the slider route. Packing them close together in the pan yielded nice round meatballs, but they eventually fused together, which I discovered after dinner when I went to transfer the leftovers into a container to refrigerate. I ended up breaking some trying to get them apart. These are tasty little meatballs. I love the flavor that parsley and fennel give to them. The first night we had them with spaghetti and homemade red sauce. I thought they were great. My spouse said he’d have preferred regular ground beef meatballs. The second night I made sliders with roasted red pepper, provolone cheese, arugula, and a little basil mayonnaise. These were really tasty! I couldn’t find ground chicken at the store so the nice guy in the meat department offered to grind some boneless chicken thighs in their industrial food processor. This didn’t produce ground chicken. It still had some largish chunks in it and it made it very difficult to form into meatballs. They mostly held together but I had to add a few more bread crumbs. Next time I’ll just purchase ground turkey. We decided to make a meal out of these sliders instead of an appetizer. Somehow we got 42 meatballs, each of which were barely smaller than golf balls. They came out juicy though and the timing was perfect. Next time I’ll add a tad more salt though, as that was the only thing that felt short. The final result was a nice simple meatball. I believe it’d make an amazing appetizer along with some type of sauce to dip it in. I couldn’t find any ground thigh meat so I bought chicken thighs and ground them myself. So in that sense, the recipe was tedious. However, the result was a very moist, flavorful meatball. After grinding, it was so easy to put together, and I baked it for a scant 20 minutes. I served it in a pita stuffed with some greens and harissa. It was wonderful. I’ve frozen some for future use. Nice little chicken meatballs—juicy and full of flavor. I was a little concerned about the ground fennel (not a big fan) and the white wine (really? in a meatball?) but it all worked. The recipe made 27 golf ball–sized meatballs and they took about 20 minutes to cook. I made chicken Parm sliders with some spare marinara and cheese found in the fridge—an easy and tasty dinner. As I began preparing these meatballs, I was concerned that I wouldn’t care for the flavor or texture of the ground chicken. I couldn’t have been more wrong. As I finished mixing the ingredients, I wondered if the mixture was too wet. Again I was pleasantly surprised: the flavor, the firm texture, and the appearance were all, I think, exceptional. The author requested that the meatballs be touching on all sides when baked. Considering the higher moisture content before cooking, this is indeed a good idea. The meatballs reached a temperature of 165° in just over 18 minutes. I chose to leave them in for another 2 minutes to allow them to brown a bit more. I served them over a bed of fried spaghetti with butter and black pepper. This was a simple and quick dish that I’ll no doubt use in countless ways. I was a little skeptical of this recipe at first; it almost seemed too easy. Are these meatballs really going to have enough flavor? The answer is yes! For calorie-saving purposes, I used 1/2 thigh meat and 1/2 breast meat and I don’t feel like I lost any flavor or moisture. I definitely wouldn’t do less thigh meat, though. The meatball mixture was very, very wet when being shaped into balls, but they cooked up nicely. The final product is an incredibly versatile meatball. Next time I make them I’ll buy a hoagie roll and some provolone for chicken meatball subs. I never thought I’d like a chicken meatball as much as I like these. I used chicken thighs, as suggested in the recipe, and ground the meat myself. The recipe comes together easily and works perfectly. I love the fennel; it goes beautifully with the mild chicken meat and adds just enough flavor to make the meatballs interesting. I served these with an extremely simple tomato sauce. I’d keep any sauce low-key, as the meatballs are mild but delicious, and you wouldn’t want to overpower them. These are delicious! I’d gladly substitute these for beef/veal/pork meatballs in my pasta sauce. They’d also be decadent on a sandwich. I ground the fennel with the salt and pepper in a spice grinder because I couldn’t find ground fennel. The cooking time was 23 minutes. I wasn’t feeling well the night I made these so I served them in a simple chicken broth with a bit of freshly grated Parmesan cheese over top. Gorgeous, decadent, and healthy! This recipe came together so quickly and is a good basic recipe for meatballs. I personally prefer ground chicken over turkey, and my meatballs turned out well seasoned and moist on the inside. I had to cook them for 25 minutes to get them to 160°, and I think this made the outside a tad dry. Maybe next time I’ll reduce the oven temperature a little or cover the meatballs with foil for the last 5 minutes. We had these with a basic marinara sauce, but the sauce possibilities are up to you and your mood! I think the fennel could also be swapped out for other spices or herbs if you wanted a different flavor. Very versatile and easy! I love chicken meatballs and these didn’t disappoint. (No surprise, as I’m a huge fan of The Meatball Shop.) The meatballs came together quite easily. I ended up leaving out the fennel, as I only had fennel seeds on hand and the recipe called for ground. The timing was perfect and they were delicious. I served them over spaghetti squash with marinara sauce. Got to have a bit of wine with my dinner, as the meatballs called for just a bit… I’ve never put wine into my meatballs before. I’d definitely make them again. 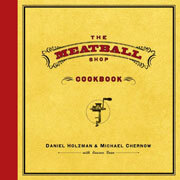 Chicken Meatballs Recipe © 2011 Daniel Holzman and Michael Chernow. Photo © 2011 John Kernick. All rights reserved. All recipes and photos used with permission of the publisher. I love reading your remarks, Ellen. Any dish you give a thumbs up to moves to the top of my “to try” list. Your comments are always helpful, too. So happy to hear that, Nancy and so glad that you have been enjoying the wealth of recipes on the site, as well as all that I have to say. Keep watching, you will be amazed at how many more great ones are coming soon! The “to try” list will get longer and longer and I am honored to be influencing that for you. These are keepers. I took your advice and served them without embellishment, with only a tender water roll as a bun, so the chicken flavor could take center stage. They strike me as quite versatile. They’d be lovely with pasta, too; perhaps with some kale wilted in the dish. I bet they’d cook up nicely as burger patties, too, for anyone who finds sliders too dainty. Swell advice, Dee! And so lovely to hear that you like them as much as we do. Many thanks…. I thought these were great. But I have to disagree with the poster who suggested more salt. A tablespoon of salt seemed like a ton to me. I used less and it was still really, really salty. Maybe I didn’t use the correct type of salt. Michelle, it’s possible that you used a different type of salt than the other tester, but I have to say, I suspect it’s more personal preference. Over the years I’ve noticed that one person’s threshold for saltiness is drastically different than another’s. Thanks for letting us know your thoughts, and by all means, definitely feel free to amend to your taste and use less next time…. I love the sliders! They will definitely be in the superbowl menu. Terrific, Tony! Magnificent to hear!